Today I have a kit plus pattern to give-away! My Puss in Boots pattern was originally published in Knit Now magazine, and came with a kit, containing enough yarn to knit one toy. If you'd like a chance to win this kit and pattern, please leave a comment below, including a contact (email, Ravelry name, etc). I will draw a random winner on November 15, so you have lots of time to enter! Don't forget to check yesterday's post, if you'd like a chance to win a free pattern of your choice. Plus, more give-away contests to come over the next 2 days! Posted by Barbara Prime at 12:27 p.m.
November 3, 2016 at 1:14 p.m.
November 3, 2016 at 1:32 p.m. I'd love to have a crack at this toy. Another cutie. November 3, 2016 at 5:27 p.m.
November 3, 2016 at 8:13 p.m.
What a great pattern......thank you for the opportunity, rav id - tmorneau. November 3, 2016 at 11:16 p.m.
November 4, 2016 at 3:40 a.m.
November 4, 2016 at 5:25 a.m.
Ooooo...pick me please :). Love it! November 4, 2016 at 6:18 a.m.
November 4, 2016 at 1:20 p.m.
Ooh! Looks great - I'm rosieatlarge on Ravelry. November 6, 2016 at 1:38 p.m.
Yikes! Puss in Boots! I so miss getting Knit Now magazine in the U.S.
November 6, 2016 at 6:55 p.m.
November 6, 2016 at 11:16 p.m.
November 8, 2016 at 12:53 p.m. So cute. 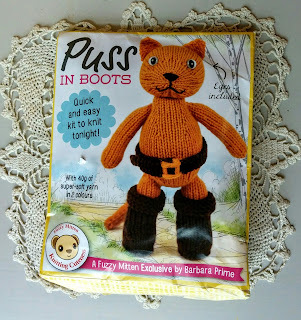 I love Puss in Boots! November 8, 2016 at 5:43 p.m.
kits are somehow the most compelling craft things ever. November 9, 2016 at 12:32 a.m.
November 9, 2016 at 9:26 a.m.
November 9, 2016 at 1:11 p.m.
My Ravelry name is Indigodi. November 10, 2016 at 10:25 p.m. Your Puss in Boots is adorable! November 13, 2016 at 6:35 a.m.
November 13, 2016 at 8:27 a.m.
November 13, 2016 at 4:28 p.m.
Great pattern. I love seeing your new creations and ideas. November 13, 2016 at 8:42 p.m.